Nollywood actress Cossy Orjiakor is set to leave the country any moment from now to Germany where she will be receiving an award as the Distinctive Daring Nollywood actress of 2015 from Nollywood Europe Golden Awards. She took to her official IG page yesterday to share a scanned copy of her German visa. if they value privacy ****************i wish her well and safe trip babe. Nigerian celebrities are a disgrace to the entire African race, how can you get an ordinary Visitors Visa to travel to Germany and you are here flaunting it on social media. 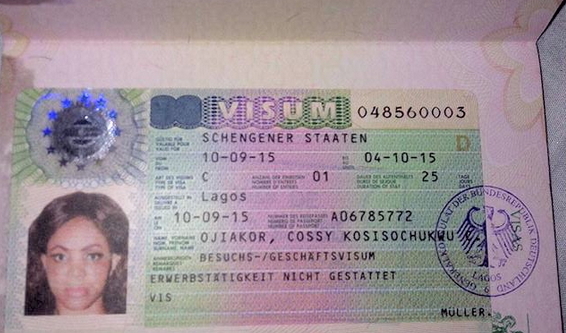 Do you think an ordinary German will get nigerian Visa and will behave this way. You should be ashamed of yourself. So why won’t the embassies be throwing us out when we que every morning looking for Visas to travel to their miserable countries when our embassies in their countries are begin them to visit our countries with free Visas and they don’t care long they even stay in our countries, wake up Africa, wakecup Nigerian celebrities. Bush girl! What is spectacular about Germany? PK.first i want to correct what u said travell to their miserable country in europen country.first nothing like miserable here PK,is like heaven.If am sick i dont worry for money to pay doctor,opration God forbid,if is that happen to anybody no problem, light 24 0 7,good road,security, i like travell by night from germany to any other european country,cos no go slow,save ,job is every where, my brother and sister finish university, 5, 7 yrs agao no job, 1 of my sister husband that get job, is inside bush working with oil company, finding where is oil, many die during going under ground,mosqitos, no light, sometime 2 month no payment, what is their salary 30.000 naira.now we stop him from going to that useless work, we give them feeding money, we now trying to move him out of naija to come here work and take good care of himself and young family he make.peace here ,no killing during election e.t.c.,but that village gal,visa put it in internet fool,what about we that have german passport.